Progressive Power Metal is not unique in Italy with numerous bands already carving a niche for themselves in this style of metal. 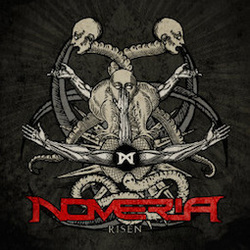 Noveria are just the newest additions to the scene with this, their debut effort. This is not the first band for some of the members with the bassist and keyboardist in particular having spent some time with other recording artists prior to Noveria. The band offers a pretty straight forward sound here with the galloping riffs of power metal and a lot of technical wizardry on the instruments to weave a bouquet of lush and majestic musical tapestry, yet bringing in a rich, full sound. Not keyboard heavy, the music is still very much guitar driven to appeal to the heavier fans, yet has the melody and mastery to appeal to the Rhapsody Of Fire as well. If I was to pick out a weak spot on this CD I would have to say it is probably Francesco Corigliani. His vocals, though definitely solid are just that. There is no major range there as he does most of his singing from a mid level (the production could be tweaked to showcase him a bit higher in the mix, which could help make him stand out), but for the most part it just seems he is just along for the ride here. Some of the songs show a bit more energy and spark from him, such as Paralysis. Overall, this is a solid album as you listen to it but it doesn't hold a lot of water. There is nothing you haven't heard before or won't hear again. The band has a world of potential but they just need to work towards making their own identity to break away from the rest of the pack and give people a reason to be vested in Noveria.